Artwork by Tekaronhiahkwa Margaret Standup. It marks the first time a female artist has done the promotional material for Indigenous Awareness Week. “I saw how much good work had been done with IAW, and, as the events started rolling in and we started building partnerships with the different faculties and departments at McGill, I realized how difficult it was going to be to cram everything into one week,” she says. 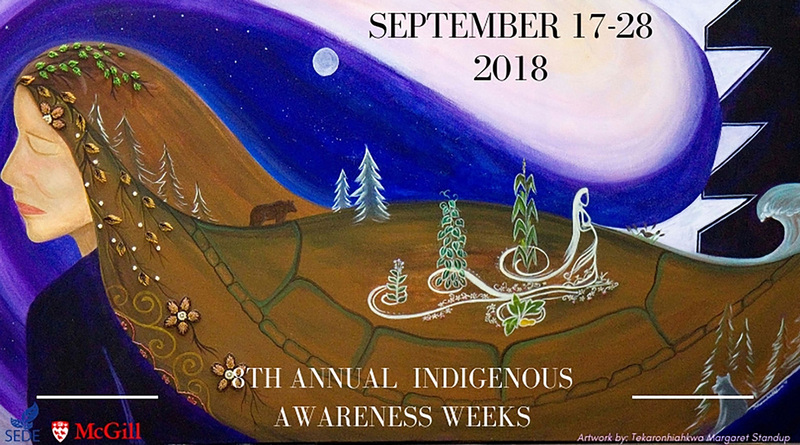 As a result, the eighth iteration of Indigenous Awareness Weeks will be spaced out over two full weeks, from Sept. 17–28. This year’s lineup features a wide array of events, including prestigious speakers, panel discussions, film screenings, an open mic and a storytelling workshop. Some of the topics that will be explored include Inuit women in the arts; strategies to create safe learning and healing environments for Indigenous peoples; and Indigenous political and legal issues. During the Launch, Elder Charlie Patton, will welcome people and open IAW – an important part of the evening. IAW’s Macdonald Campus component will be happening later in the fall around the time that harvest ceremony happens in Haudenosaunee tradition. Participants will take this time to learn about what it means to give thanks as a way of life, not a day in life. Stay tuned for details to come on this event. It might be hard for people to single out one particular person or event as “must-see,” as the quality is so high and the lineup so diverse. Be it the lecture by lawyer Jodie-Lynn Waddilove; the workshop/concert by bluesman Murray Porter & Elaine Bomberry; or the Commodification of Spiritual Items panel involving members of both the Indigenous and Tibetan communities, the highlights are many. “We’ve spaced it out so that rather than having three of four events in a day, there will only be one or two,” she says. “We did that because the lineup is so strong, I don’t want people to have to choose between events. And, of course, there will be the First Peoples’ House annual Pow Wow on Sept. 21 – always a highlight in the McGill calendar. “I made sure not to schedule anything else on that day because, well, Pow Wow day is Pow Wow day,” says Kasperski with a smile. Just days away from McGill’s eighth IAW, Kasperski says she hopes the event showcases the diversity, beauty and creativity of Indigenous cultures. Please note: The IAW 2018 launch event will be held on Monday, September 17 from 4:00 p.m. – 7:30 p.m. at McGill’s Faculty Club. Enjoy an evening of artwork, networking, honouring and celebrating. There is limited space, so please reserve your free ticket via Eventbrite ASAP.